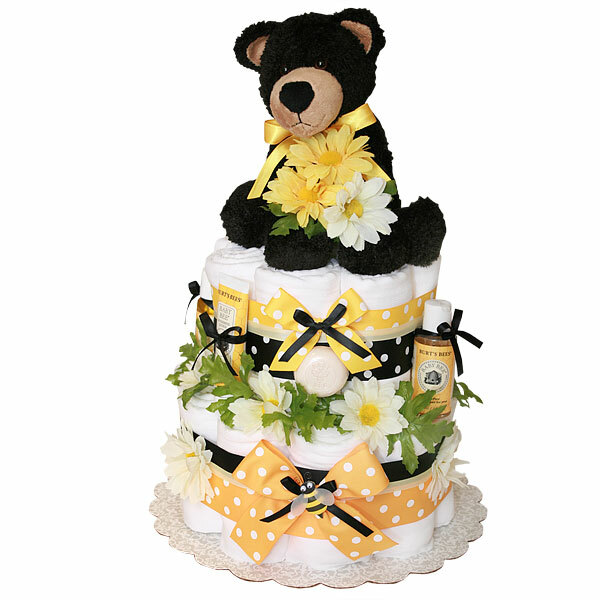 Beautiful, handmade Bear and Bees Cloth Diaper Cake! It's a great gift for mom-to-be and her baby, who wants to use cloth diapers. This cake is made of 24 prefold birdseye 3ply cloth Gerber diapers with absorbent padding 100% cotton diaper; one Burt's Bees Baby Bee Getting Started Kit (one Baby Bee Nourishing Lotion 1 oz, one Baby Bee Shampoo & Wash 1.8 fl. oz, one Baby Bee Diaper Ointment .75 oz, one Baby Bee Nourishing Baby Oil 1 fl. oz; one Baby Bee Buttermilk Soap .8 oz); one cute plush Bear. Decorated with lots of ribbons, bows, scrapbook embellishments and silk flowers. The diapers are held together by ribbons no glue on diapers. This cake sits on a 10" corrugated cake board and more than 16" high. Comes wrapped in cellophane with coordinating ribbons and bows. All our diaper cakes made of highest quality ingredients with greatest care and love. Everything included is ready to use and easy to disassemble.